The entrance to Morrisons car park and the lower section of Bell Street were overwhelmed with water bursting from drain covers adding to the water running down the roads. It wasn’t just the roads that were flooded… such was the intensity of rain that Priory Park was also left with surface water pooling up several inches deep on the pitches, and even more in the sunken garden and around the cafe. 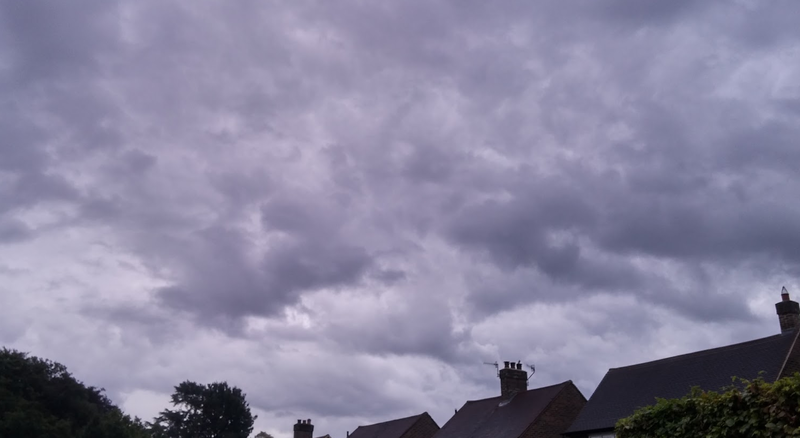 This rain event was accurately forecast by the MetOffice and MeteoGroup and several specialist severe and convective weather met agencies who all issued warnings of heavy thundery rain, some totals suggested over 60-90mm. 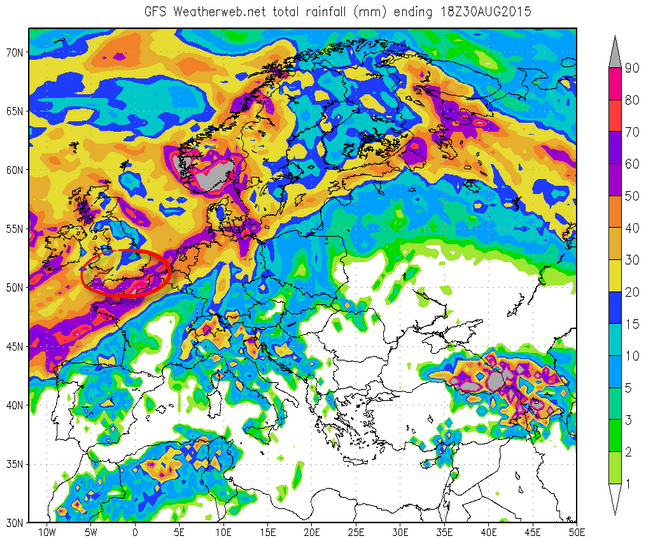 Two models, the MetOffice Euro4 and WRF NMM model output, turned out to be especially accurate with both putting exceptionally heavy rain precisely over our area at least 24 hours in advance and this was reported by RGSweather on twitter. The GFS model was less convinced about such heavy rain reaching beyond the south coast but, as always, these convective summer events are especially hit and miss. Today was a “hit” for Reigate but unfortunately would have probably caused a nuisance for businesses and commuters. The maximum intensity of the rainfall in Reigate was measured at 145mm/hr during the storm between 2-3.00pm. This intensity of rain is unusual in Surrey (highest rainfall intensity in recent years was 183mm/hr 20 Nov 2013) but we are told to expect more of our rain to fall in intense events like this with global warming. The last time flooding of this scale took place in town was 24 Dec 2014 but, having seen both events, I think this time was slightly “worse”, although given summer conditions the surface water may have subsided quicker. There are many areas for further investigation worthwhile here: how much rain, for how long and with what antecedent conditions (soil moisture / season / evaporation etc) and what duration of rainfall intensity causes flooding in Reigate? The synoptic weather situation that caused this event was a trough over the Atlantic and a blocking HIGH over Scandinavia causing a warm unstable humid airmass to meet cooler Atlantic air along active fronts. The resulting LOW transported a lot of moisture over the SE and caused the rain in heavy thundery downpours triggered near the fronts. This situation is not likely to change much until later this week, so expect more rain but hopefully not as intense. An unstable airmass with backing winds over the SE indicated by a skew t chart from the day. Technically speaking this was part of a “trough disruption” event (see charts above) that started over the Atlantic during the weekend. A “trough disruption” is when an upper trough “breaks” and a southerly section of the trough proceeds purposefully east or NE leaving the centre of the trough behind as a semi-static feature. The isolated part of the trough can then behave erratically. In this case an unusually active and southerly dipping jetstream for the time of year also played a part in deepening the LOW at the base of the disrupted trough. Weather events can be “severe” and unexpected with models sometimes struggling to cope when trough disruptions occur. 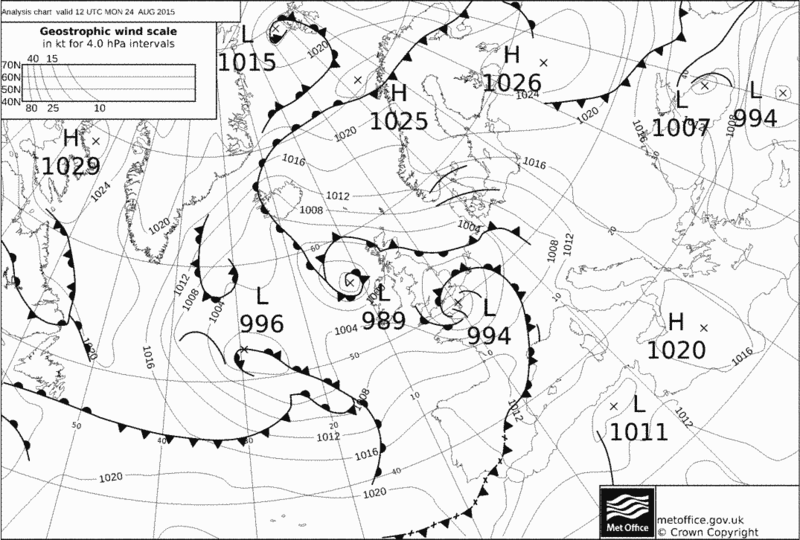 The LOW pressure that brought heavy showers over the SE and Reigate formed in Biscay yesterday and travelled NE up the English Channel during the day. SE England therefore experienced SE / easterly winds in the morning, backing northerly and finally swinging westerly during the course of the day, fairly unusual for our part of the world. The anticlockwise change of direction in wind is called “backing”. Veering is the clockwise movement of wind over time or with height. Finally, we can expect more rain this week as the synoptic situation stays static with the Atlantic trough blocked by the high out East. This situation will keep us in a flow of humid moist air that, when it interacts with cooler Atlantic airmasses along fronts, is likely to cause rain. Add an unusually active jetstream and we have a decent recipe for a wet week. 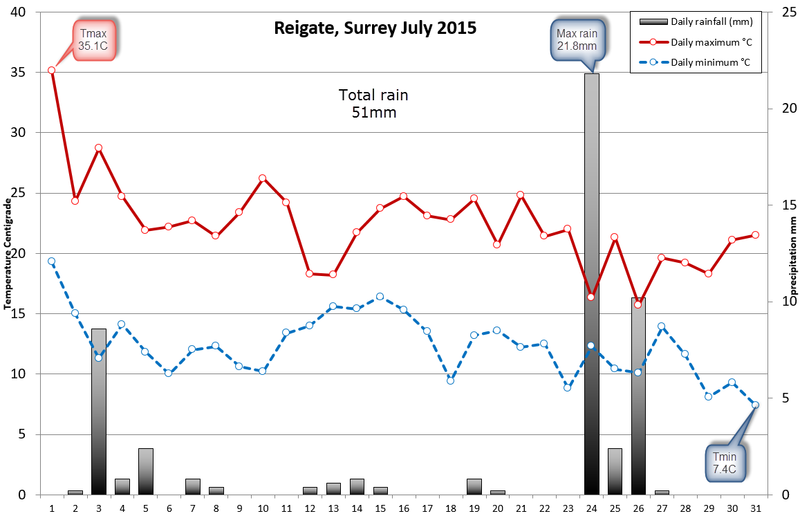 July 2015 in Reigate started hot, reaching 35.1C on July 1st due to a Spanish Plume. The first day of July broke the record for the hottest July day when Heathrow spiked at 36.7C as cloud cleared around the airport allowing sunshine to heat the surface through an already very warm airmass. This caused a heat spike at Heathrow and elsewhere that allowed the MetOffice to announce 1 July 2015 as the “hottest July day since records began and the hottest day since 2003”. This set climate / weather data skeptics in a whirl as they spotted that the nearby Kew Gardens weather station did not correlate with the same heat spike at the same time allowing them to claim it was simply due to hotter local conditions from the local airport tarmac, a change of wind direction or even heat from a passing plane. The photos below show the locations of the Heathrow weather station adjacent to the Northern Perimeter Road west and the Kew Gardens weather station. In response to the doubt, Mark McCarthy, a climate scientist at the metoffice, was quoted in this article explaining that the heat spike was neither due to passing aircraft, nor a change of wind direction or any micro-climatic influence from tarmac and that the temperatures from Heathrow are representative and so the record stands. In discussion with RGSweather on twitter, Mark also explained that the last 10 years of daily Tmax observations from Kew Gardens and Heathrow differ only by <0.03C on average. This debate was akin to the wider global warming debate where met agencies present data that is then questioned by skeptics who present data that appears to contradict the claim. In any case, July 2015 started hot! Unfortunately, July temperatures then promptly collapsed across the UK and the CET came out around average as westerlies returned from an anomalously cold North Atlantic. Despite a lack-lustre July in the UK, globally, July turned out as the hottest month ever recorded. Reigate and the SE had an average month being just nearer the European heatwave that dominated July. Overall the monthly temperature came out a tad below the CET long term average, continuing a run of 3 cool months. Further north and west July became a decidedly cool wash-out, especially in Scotland where snowfall occurred over some mountains. Night time minimums were cooler than usual and some records were broken for lowest ever July night time minima. In Reigate we recorded a Tmin of just 7.4C at the end of the month. Here are metoffice anomaly charts showing how Reigate and the SE stayed warmer and drier than elsewhere. SE rainfall overall came out above average mainly due to thunderstorms delivering locally heavy precipitation. Reigate at 51mm came out nearer average because most heavy rain missed us. Although not local to our area, a thunderstorm over the Brecon Beacons in early July killed two people on top of Pen Y Fan and Cribyn. The photo below shows this thunderstorm. Globally, NOAA and JMA (Japanese met agency) reported that July 2015 was the hottest month ever recorded.